I love these pillows, they're the perfect height for me for sleeping. They do not have the fluffiest appearance, so I paired these with a set of higher density pillow for appearance and for reading in bed. Very happy with this purchase. Improve your sleep with these support pillows from Circle of Down. A layer of fluffy plush down surrounds the core of feathers to create a firm pillow that offers excellent support for all sleeping positions. 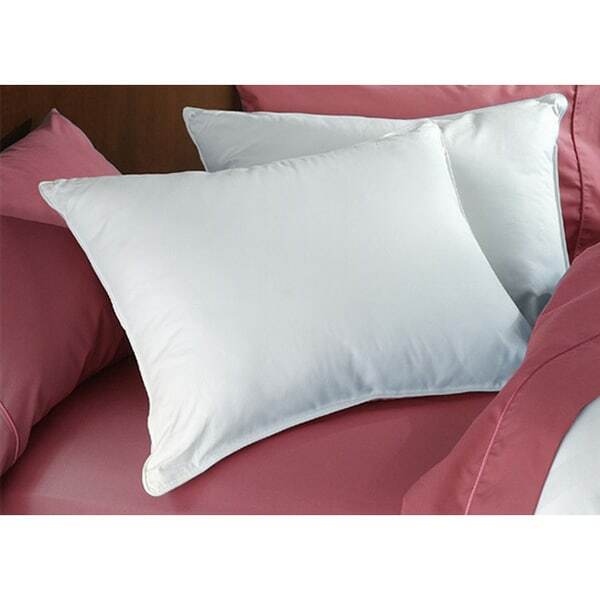 These down and feather pillows also feature tightly woven cotton fabric construction to prevent feather loss and shape changes. My wife has been searching for several years for the "perfect pillow". she sleeps more on her side and stomach, but still likes decent support. We have tried roughly 8 different pillows, until now. Recently, she stayed at a hotel with a similar two layer pillow, and gave me the task to buy her one. On the hotel website the pillows were $70.00 each, and here came what appeared to be a great deal on Overstock. Ordered the pillows and she can't be more pleased. Soft but supportive, comfortable in all positions, high quality and durable filling (fluffs perfectly every morning) superior quality fabric. Just really nice. Can't recommend highly enough. Not too thick, not too thin. I have looked and researched this pilllow for a long time before buying because i was worried it would be too limp/soft. It is a nice comfortable pillow; it is not overstuffed like some pillows i have purchased and not too soft either. If you are wanting a firm stuffed pillow this is not the one for you, but it is not a limp soft pillow either. It is just right in the middle, and I have had lots of down pillows, so I know what I am talking about. I have not had it long enough to say how it will last or wear. I have purchased many down pillows on Overstock, and this one is not as firm or filled with down/feathers as much as most of the pillows i have purchased, but it still feels good and has support. I have not had problems with feathers sticking out or anything like that. It is a good medium support down pillow, and i am happy with it. Just hope it lasts. Good pillows. Not as soft and fluffy as my pure down one, but great alternative. The pillow consist of: inner chamber - 87% duck feathers, outer chamber -13% down (min 75% down). So it would be more accurately described as feather-down mix, not down pillows. Some feathers will poke and they are dark color, so use of protective cover is strongly recommended! I have ordered circle of down pillows before in standard size and was very happy with those. I have had them for three years and they haven't lost any feathers. Like all down pillows, they get flat, but once I fluff them, they're perfect again! I find them very comfortable, and haven't noticed any poking from larger feathers. Because I was so happy with the standard pillows. Because I have a king size bed now, all my standard pillows are too small for the pillowcases! The king size circle of down pillows fill out the pillow cases very nicely and are the same great quality as the standard pillows. Thanks for making a great product! These pillows are so soft, your head sinks right in. They are a great value compared to other pillows that are 2x to 3x as much. We are very happy with these new pillows. We love them. These pillows are equal to down pillow which I paid $80 for (one) at Bed,Bath & Beyond. I have these two and the BB&B one on my bed and can't tell the difference. With the down surrounding the feather core it is much less expensive but still feels like a down pillow. No "crunchy" feathers and the feather core helps it keep its shape better. Doesn't flatten out like a down pillow. I'm very happy with this purchase and definitely recommend it. I did read many of the reviews before buying them. I've had a lot of pillows in the past that start off pretty firm but over time tend to be more flat. I like to sleep on my stomach and side so want a pillow that feels like I am sleeping on a pillow and not just the mattress. These are soft and pliable but keep their shape around my face that doesn't flatten while sleeping so they are exactly what I wanted. I also like they are a little longer than a standard pillow but fit in a standard pillow case. I didn't notice any smell at all when opening the package. I did buy a zippered cover just in case any feathers should try to escape. I don't like having feathers coming out of my down/feather products. Definitely not firm enough to cause any problems with neck stiffness. this is the second set of circle down pillows for us. Love both sets. Great bargain for that extra set of pillows for the guest room or replace the ones on your own bed. These are NOT pillows that bounce your head back like a rubber ball. They cradle your head when you lay down. Very comfy. Can't beat the value anywhere. These pillows have feathers that poke through constantly! I barely use them, and the last time I did the seam opened up, and I had feathers everywhere. I thought these pillows would be a little firmer than what they are. They look nice and fluff back up, and if you like crunching up your pillow, this is the pillow for you. But to just lay your head on there is no support you sink, it just flattens out. I would recommend this pillow only for those who are looking for a pillow to chrunch up, or to look nice on your bed. I ordered these pillows to replace some very old feather pillows I have loved for years, and they are just as good if not better than the old ones! They shape to my head and can be shifted as I change position in bed. I don't like pillows that fight back to keep their shape, so these are perfect. These pillows were advertised as soft to firm, I would say softer than I expected with the feather core. I bought my last pillows through *** their Northern Lights collection and I wish I would have stayed with those. Wouldn't buy these again as I like a little firmer pillow and the down in this shifts to the ends of the pillow to much. Not a horrible pillow but not what I was looking for. I do like that so far I haven't been poked by any feathers escaping the cover, and the price is good for what you get. I was disappointed with these pillows. Both my husband and I usually sleep on two pillows. Instead of buying 4 pillows, I decided to order two at first to see how we like them. They are very flat. I would have like more filling. I find myself waking in the night because the pillows are just uncomfortable. I wouldn't recommend these. I love these pillows! I’ve had them for 4 months now and they’ve withstood the test of time. Down is always pricier than down alternative but it’s totally worth the extra money. Great value for the price, very comfortable. Good quality if you like feathers versus down. Great pillows. I’ve washed them and they’ve kept their shape and stayed fluffy. They are also super comfortable. I don’t think they’ll ever be flat! Disappointed in this pillow. Find it to be too soft and does not hold its shape. Would be too much trouble to return so I am keeping them. I love these pillows. They are just the right blend of softness and support. I like them so much I bought two more.I have the king-size pillows. These are Super soft natural pillows. We love them. My whole bedding is from overstock now. Perfect fit for my king size bed. I have been really pleased with these pillows! They hold their shape very well and are super comfortable. They fit in a standard size king pillow case. We hope these hold up for a long time. "What is the percentage of each of the feathers ?What percentage is feather and what percentage is down feather"
These pillows are 15% down and 85% feather blend. "Why is this Circle of Down feather and down pillow cleaned by dry cleaning? Is is possible to launder at home in washing machine and dryer? I am buying it, in part, because it is hypoallergenic and am trying to avoid dry cleaning chemicals in my life. I like all aspects of this pillow except for the dry cleaning recommendation. It is JUST a recommendation?" The manufacturer recommends that these pillows be dry cleaned. A friend ordered them awhile ago and is very happy with them. Our down pillows are older now, and we needed replacements. Reviews, specs and price! Keeping my fingers crossed!!! Can't sleep on any thing else. Old pillows are worn out. "are these the same as the set of 4 circle of down pillows? I need two of those only...can I buy only two??" These are the same pillow as the set of 4, this is just the set of 2 option. "What is the difference between the "Standard" and "Super Standard" sizes?" The super standard is a little bigger and has more fill. "What is the size difference between a Standard & a Standard/Queen pillow?" The standard sized pillow is: 20 inches wide x 28 inches long with 28 ounces of fill. The queen sized pillow is: 20 inches wide x 30 inches long with 32 ounces of fill.